The safari-themed doors of McMahon Hall’s second and fifth floors are teeming with fern leaves and pith helmets marking the names of freshman residents — up to nine in one suite. The freshman class’ title as Fordham College at Lincoln Center (FCLC)’s largest class yet comes with an increased need for on-campus housing, which has led the university to convert McMahon’s double rooms into triples. While freshmen triples have previously occurred in McMahon, this year’s increased population has led to at least one triple in every room — in the most crowded dorms, up to nine people share one fridge and six people share one bathroom. On move-in day, freshmen in triples arrived to find their bedrooms set up to accommodate enough furniture for three people in rooms usually used for two, which meant desks and dressers in closets and bunked beds. First-year students were alerted to the possibility of forced triples early on during the summer and were notified of their status through their housing assignment email by the second week of August. Students living in a triple receive the accommodation of a reduced rate, paying $5912.50 per semester rather than the standard $8262.50 in McMahon. Jenifer Campbell, senior director of residential life, told The Observer that Fordham followed procedure from earlier years and utilized the building floor plan’s information about room size to select which rooms could become triples. Despite this precaution, many freshmen still find their living quarters to be cramped. “There’s not enough space for everything,” Laura Vasquez, FCLC ’22, said. “One of the dressers was just in the closet when I came in, so I had to move everything around myself and see how I was going to fit it.” Vasquez, like many other freshmen, relocated her desk to the living room in order to clear up space in her and her roommates’ bedroom. Other than their reduced room rate, freshmen in forced triples did not receive any other accommodations or resources specific to living with an increased number of suitemates. The resident assistant and resident freshman mentor for the McMahon freshman floors were alerted during training in August about the forced triples but were not given any additional training in response to the increased number of residents. Residential Life did not say if the RFM received additional compensation for their extra responsibilities other than the standard half room rate and meal check. This increase in the number of residents on the floors, without a proportionate raise in benefits, means that the floors’ RFM still pays half of their room and board with nearly twice as many residents to take care of. In order to ensure McMahon freshmen can participate in freshman programming held in McKeon Hall, Residential Life set up a system between the two buildings in which McMahon freshmen can identify themselves to security personnel via a sticker on their ID and sign themselves in between the hours of 6 a.m. and 10 p.m.
Amid the crowding and confusion, however, residents in the forced triples have also come to appreciate the opportunity for community-building within suites that the situation presents. 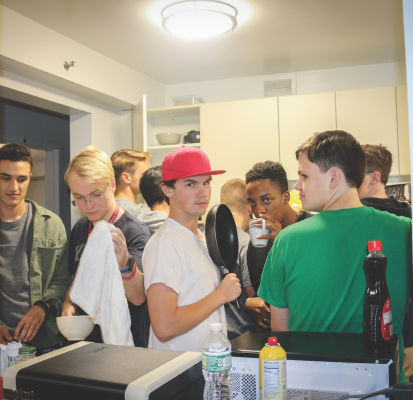 Aiden Tice, Gabelli School of Business (GSB) ’22, who lives in a nine-person suite, said he actually enjoys the bunk beds and credited the close quarters for he and his roommates’ strong friendship so early in the year.